The pitched battle that has raged for four weeks between Marcus Armstrong and Liam Lawson took on an edge this afternoon at Manfeild with a sublime performance from Armstrong. The pair were on the front row for the 20 lap race around the 3.03km Manfeild course with Lawson on the ‘clean’ pole line and Armstrong on the outside. At the start, Lawson’s car stumbled and Armstrong made no mistake, arrowing into a lead he would never relinquish. 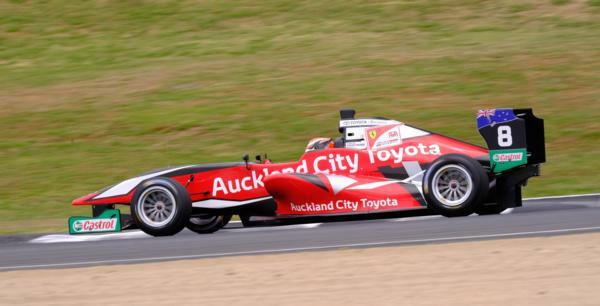 The experienced Christchurch driver has said from the start of the championship that the title can only be won from the front row. He had been concerned about his qualifying pace, but the race and win had put him back in the title hunt. Qualifying well is critical in TRS because it allows access to those prized front row grid positions. Armstrong was not completely happy with his qualifying but the start was a different matter. “I was very happy with the start. It was important to get a clean launch and get into turn one in the lead,” he told TV crews after the race. Lawson afterward said he had trouble judging the clutch ‘bite’ point for the start. With Lawson and Lucas Auer in hot pursuit, Armstrong spent the opening five laps building a lead of more than a second. Lawson was locking his front brakes in a desperate charge to get closer. The pair traded fastest times, Armstrong fractionally quicker than his M2 Competition counterpart establishing a 1.5-second lead as the race reached half distance. Two laps later Japanese driver Kazuto Kotaka went wide at Higgins. Regaining the track he then collided with Petr Ptacek at turn 7. Both drivers were stopped in the gravel trap and the race went under the control of the safety car, stopping under a red flag a lap later. On the restart Armstrong once more demonstrated his European experience and held the field at low speed while the safety car got clear of the track, then launched away and down the front straight, immediately establishing a handy lead over Lawson. The Ferrari-backed driver controlled the race over the remaining laps and punched the air in jubilation as he took the chequered flag. Armstrong’s win now puts him just one point behind Lawson with two races to go, and raises the prospect of the championship being won in the New Zealand Grand Prix itself.